President Richard Nixon signed the Endangered Species Act into law on December 28th, 1973, 40 years ago today. In passing the bill into law, the 93rd Congress acted on the understanding that without this safeguard, many of our nation’s fish, wildlife and plants would become extinct. In the 40 years since its passage into law, the act has helped to save species like the bald eagle, humpback whale, peregrine falcon, and others from extinction. 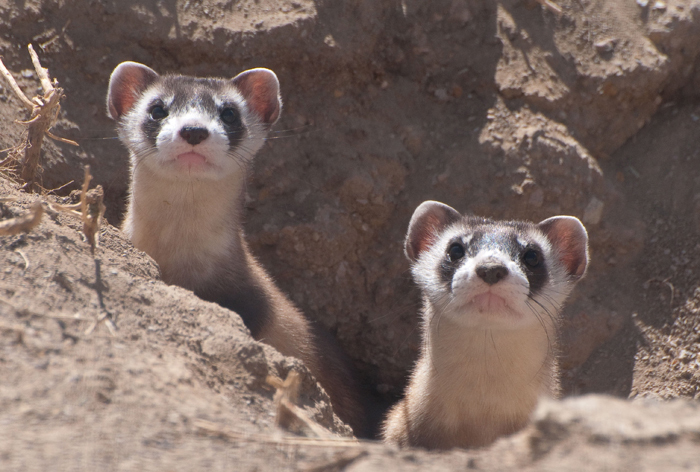 Among its most memorable stories of recovery is that of the black-footed ferret. These masked mustelids once numbered in the tens of thousands, but were thought to have been driven extinct by disease, habitat loss, and poisoning of its primary prey species, the prairie dog. After a Wyoming rancher’s dog brought a dead ferret to his owners in 1981, wildlife officials were notified and a nearby colony was discovered. This ultimately led to a captive breeding program and while still highly endangered, the ferret is now on the path to recovery thanks to the Endangered Species Act. In celebration of the act’s 40th anniversary, the Endangered Species Coalition published the report Back from the Brink: Ten Success Stories Celebrating the Endangered Species Act at 40. The report highlights ten species that – thanks to the Endangered Species Act’s protections – are either steadily improving or have been recovered and removed from the list of imperiled species. They include the nēnē goose, American peregrine falcon, El Segundo blue butterfly, Robbins’ cinquefoil, bald eagle, southern sea otter, humpback whale, American alligator, brown pelican, and the green sea turtle. All of the species in the report were nominated by Coalition member groups from around the country. We also published a book of essays from a diverse array of almost one hundred people from a variety of backgrounds sharing their perspectives on the importance of protecting wildlife through laws like the Endangered Species Act. You can learn more and download the book at awildsuccess.org. More than 1,300 species of plants, fish and wildlife in the United States have been protected by the Endangered Species Act, and only ten have gone extinct, according to the U.S. Fish and Wildlife Service. Additionally, a recent study found that 90 percent of protected species are recovering at the pace expected in their scientific recovery plans. The 40th anniversary of the Endangered Species Act is a notable milestone in our nation’s uniquely forward-looking desire to maintain species for future generations. Without it, our skies, forests, mountains, and seas would be less diverse and our planet far less healthy. We need to continue to demand that same spirit of conservation exhibited 40 years ago by Richard Nixon and the 93rd Congress from our elected officials today.